I've decided to incorporate more music on my blog since music has always been a huge presence in my life. Also, there's so much junk on the radio that I already spend a lot of time finding better music and new artists (or at least new to me), so I figured that every so often I'll share some treasures I unearth. Hope you guys enjoy these music excerpts! As a student, I understand that the beginning of December means one thing. FINALS. And besides tons of prayer & the knowledge that God is on our side, the big thing that gets me through the stressful season of studying 24/7 is listening to good music. So I thought I'd share some new up-and-coming musicians/artists that I've been listening to recently to help you get through finals, or if you aren't in school, then just to discover & enjoy (or not, but at least you tried). My friend Ryan of Sleeping At Last tweeted about these guys and I was hooked instantly. I bought their first EP "Lost&Found" and found out they wrote the song "Try" that Pink recorded. Cool beans! Definitely recommend their EP! I promise it will be useful during your midnight dance parties to stay awake. (If you don't have midnight dance parties, you should.) "Get Lost" is my favorite dance/sing-a-long selection from the EP. One of my favorite resources for new music is Noisetrade. I randomly came across these guys and love their first EP "Paper Hearts". It makes me so excited for their first full length album which hopefully will happen soon. But for now, you can get their EP for free! Take a listen and let me know what you think! 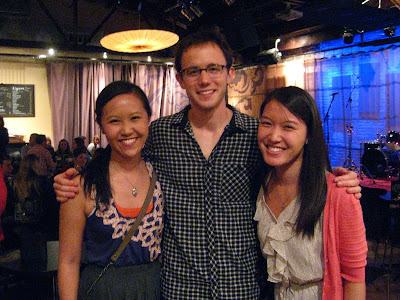 At a Steve Moakler & Andrew Ripp show in Chicago, we met their awesome bassist, Blake Stratton, who is a Chicago native. His sister was at the show and being a proud sister, she told us that he was releasing his own music. That was enough for us to get our hands on his first album (recorded LIVE! Crazy awesome.) which you can now grab for free! I may be biased since he's a good friend, Jess plays in his band and I have too. But I don't care, Anu is one talented songwriter. If you're in the Chicago area on Friday, December 20, he's opening for one of my all-time favorite artists, Andrew Ripp!!! Get your tickets & more info for the show here (I promise tons of great music) and get this guy's first EP "Still Life" here! Listen & let me know what you think! Have you listened to any new music that you're loving? Please share! I'm always in need of new music!